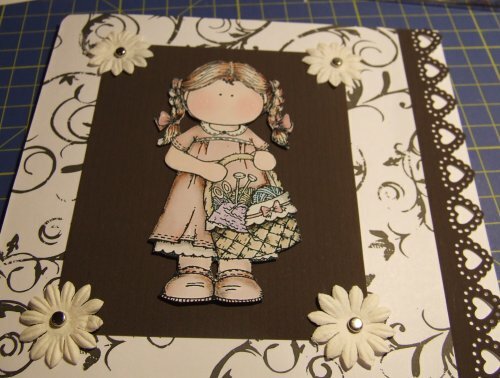 I just love the new sweet flourishes from Liz and this is the chocolate and cream colourway. The little girl is a Hanglar image. The tiny blossoms are cream and although you can’t see the cream background very well because the light is bad at the moment, it does match beautifully really!! The chocolate is a PP solid colour and the edge is done with the MS valentine lace border punch. 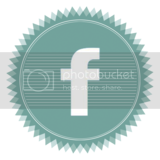 I just had to have a go at making one of these. 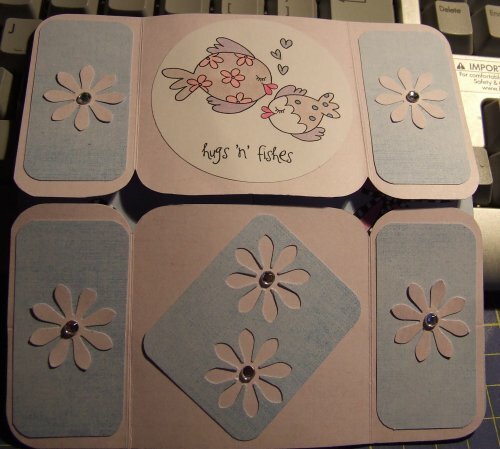 I made mine using double sided printed card from PP in the all washed out set and used the best fishes image. It would take too many photos to show you it opened out in every way but it is such a clever idea. 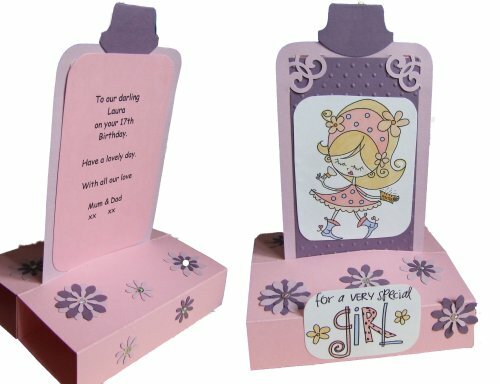 Kids would love it and it would make a lovely keepsake if made for a wedding with different messages in it. 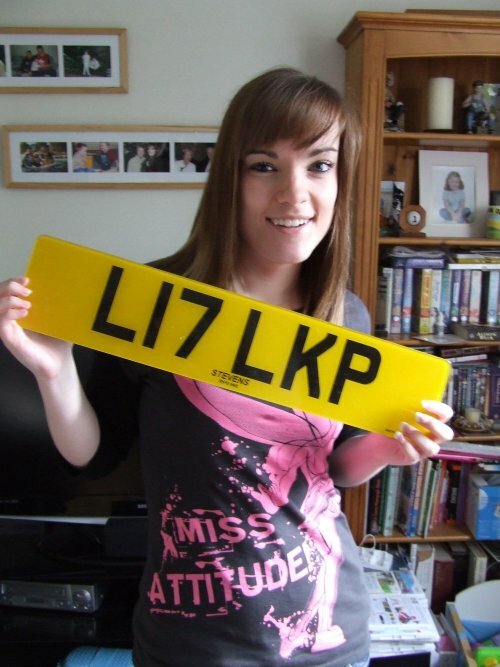 Today is Laura’s 17th birthday and her main present from her Dad & I were personalised number plates for her car – she was so surprised as she had chosen them over a year ago and really wanted them and thought she was going to have to save up! Her Dad put them on her car for her too and she spent the day here with all of us and her boyfriend and we had a nice lunch followed by a Thorntons chocolate cake which Liam enjoyed as you can see!!! We are taking her out to her favourite Italian restaurant this evening so this should round off a lovely day for her. Look what the postman bought me!! I only ordered them a week ago from this fab lady in the US and they are here!! for Laura for one of her sisters to give her. 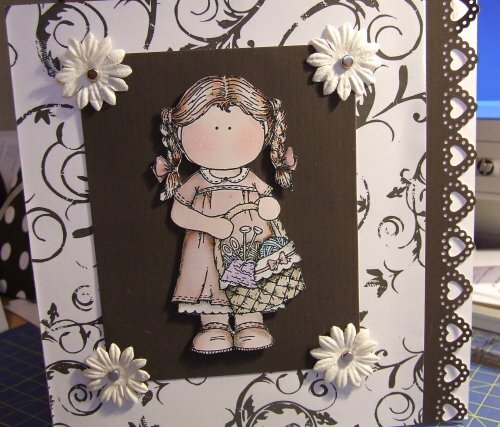 PP papers, border cut with MS lace punch and a flower for good measure! I cannot believe my tiny baby girl is 17 this Thursday! My tiny ‘bag of sugar size’ baby who fought hard for her life is now a beautiful young woman, Happy Birthday my sweet, darling girl. I hope you get all you wish for. 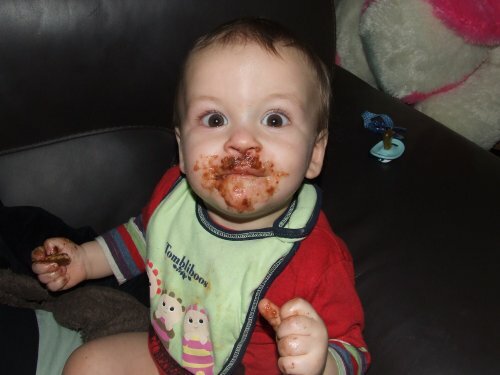 For me it is a question of where did all those years go?! I didn’t really think I would be sitting here facing my 50th birthday in a couple of months and it all makes me feel very old! Still I do sometimes look at my children and get this lovely warm feeling and feel very proud that “I did all that” because for the most part it was just me and they turned out ok even if I do say so myself!! Mind you lots of other people have said that to me over the years and it is things like that which really fulfil me. I may not have achieved much in my life but I feel very blessed and very lucky to have 5 such wonderful kids and consider them all my very best achievement. Back to the card!!! 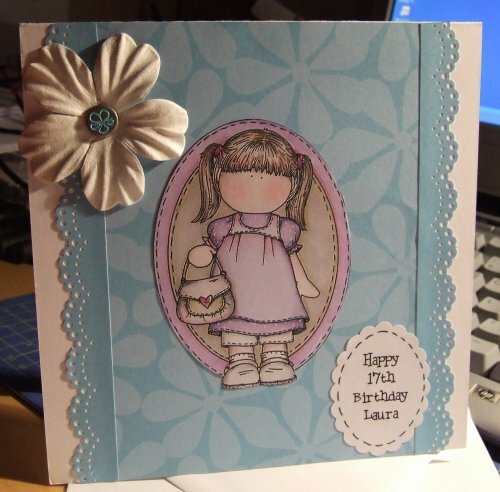 I made this cute pop up card and decorated it with a PP Frilly Milly and some punched flowers, jewels and a bit of embossing. 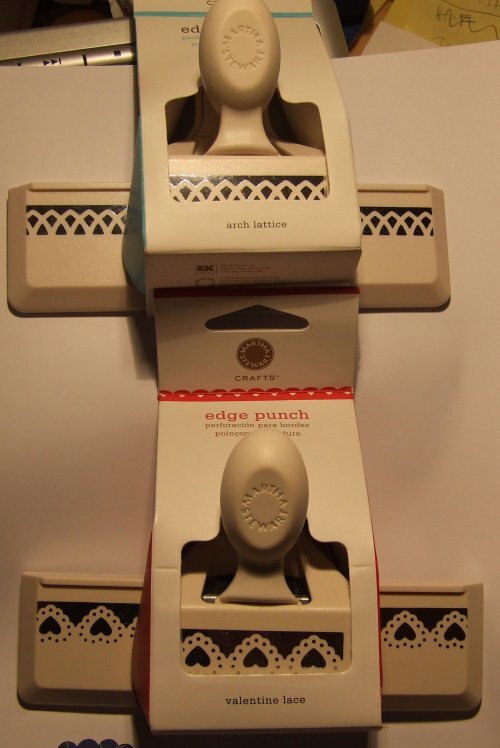 An SU tab punch for the bit to pull as it folds completely flat to go in an envelope, very clever idea – sorry can’t remember where I saw it! Everyone has been so kind I felt I must let you all know the latest news. Well they finally gave her anti-emetic meds yesterday but she had to go back on the drip. She had a bag of normal fluid and one with potassium and Louise said she is like a different child, brighter and chatty and she ate some chips from McDonald’s last night!! They did say she could have whatever she wanted and just like a typical 5 yr old she said ‘chips’ – never thinking she would eat them but she tucked right in! Fingers crossed this continues and she improves enough to be let home. Thanks for all your kind thoughts and good wishes.